Here are some basic facts on the history of the shrine. 1. 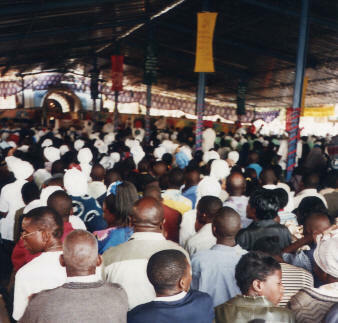 From the time of Archbishop Adam Kozloweieki, S.J., the Lusaka archdiocese made it a practice to have a pilgrimage on the feast of the Assumption in one of the parishes - but open to all parishes. Date: late 60s. 2. 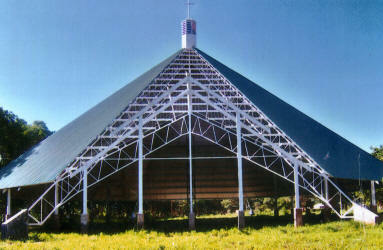 In 1974, the Archbishop brought a statue of Our Lady of Fatima back to Lusaka from Fatima. 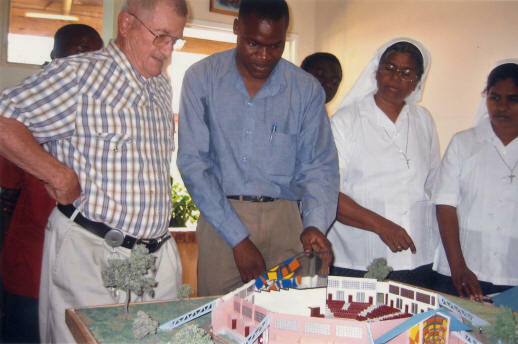 He asked me to form a committee to see to it that the statue visited each of the parishes in Lusaka. 3. After the committee did this the Archbishop commissioned us to find a suitable place where the statue could be placed in the Archdiocese as a place for pilgrimage and prayer. 4. Fr. Lawerence Tomasin, S.J. was an excellent builder, besides being a good missionary. He built a small shrine - a miniature of St. Peter's in Rome for the statue of Our Lady. 5. From that time onward, the Marian Committee continued to meet and conduct monthly pilgrimages to the grotto from parishes. 6. In the 90s the area of the grotto was expanded and sheltered by a steel pavilion to shield pilgrims from rain and sun. 7. For the annual pilgrimage on August 15 each year from four to five thousand pilgrims are present. 8.The Sisters of Immaculate Conception from India have been invited by the Archbishop and are in charge of the shrine and its care. Sr. Alphonsa is Superior. The Marian committee of archdiocese meets monthly with Fr. Dominic (Salesian Father) as chairman. Finance sub-committee of this Marian shrine committee was formed with Fr. Anthony Jansen, as Chairman. 9. The main project then was to build a shrine church where the Blessed Sacrament could be suitably preserved and open for adoration and prayer. The Marian shrine as a whole, should in some way express the whole story of salvation history. We are not making a mistake in using the word "whole" twice. In the first instance it refers not only to the grounds and grotto area, but also to the shrine church itself. In the second instance, we refer not only to the story of the Old Testament leading up to the coming of Christ, and the mystery of the Incarnation and Redemption in which Mary plays a significant part, but also to the final phase of Christ's triumph over evil in the world through the mystery of the Church and His Final Coming. 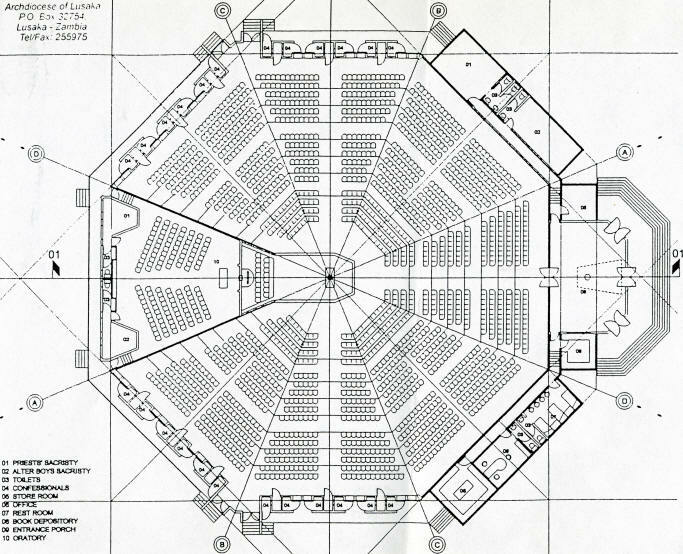 This final phase should be especially evident in the very construction and artistic portrayal of the shrine church itself. Thus, it should highlight the very title of the shrine; "Mary, Mother of the Church". 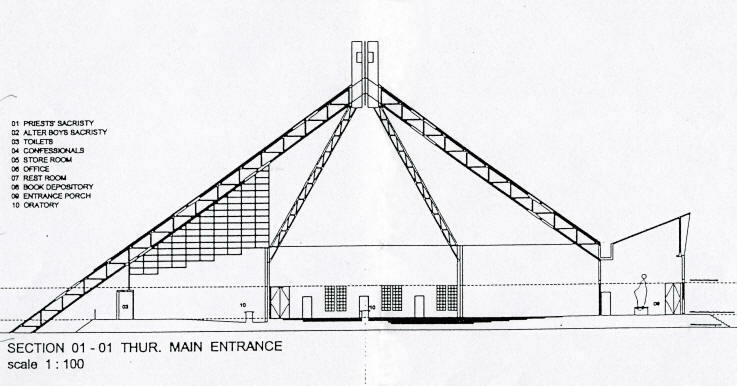 To achieve this, the construction of the shrine church should have three distinct, yet very clear focal points. This statue stands for the Church, first of all, in its ambivalent struggle against evil, yet at the same time clothed with the sun in triumph. Mary is the sinless image of the Church who already stands in triumph over evil yet is ready to reach out to her children in need in their hour of struggle. 2. From this vestibule one enters directly into the main aisle leading to the main sanctuary and altar. The focal point of attention is the altar, but also behind it in very visible sculptured dimension the scene of Calvary with the cross, Mary, and the women, and John. On the walls on either side of the sanctuary... there are four murals, two on each side of the sanctuary, depicting specific instances in the life of Jesus. 3. Behind this wall, in a direct straight line from the Woman clothed with the sun, and directly below the the scene of Calvary, is the tabernacle of the lamb as portrayed by Revelations 5: 5-13. Access to this tabernacle can be made directly from the sanctuary of the main church in order to procure the Blessed Sacrament or to repose the Blessed Sacrament. 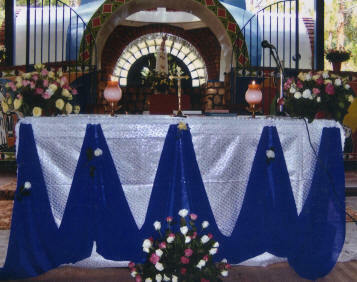 Yet, the tabernacle cannot be seen from the main church. This Lamb is already dwelling with this people in the mystery of the Holy Eucharist. In the construction of this shrine church there is one line of focus from the woman clothed with the sun, to the moment of Christ's Suffering on Calvary to the tabernacle . The purpose of this is to emphasis the integral connection and importance of each of these mysteries, i.e. there will be no more effective way of bringing about the triumph of good over evil in our world than through Mary, who will lead us to imitating and following her Son in his Pascal Mystery, and worshipping Him in His Eucharistic Presence. These three elements are the key to the triumph of the Church in the world. *Cf. James Leon Holmes, "Clothed with the Sun" pgs. 20-27 in Homiletic and Pastoral Review, January 2001 for the place and role of Mary in the mystery of man's struggle over evil. **Cf. Barclay, Wm, The Revelation of John, volume II p:173 "Here is the truth that heaven and earth and all that is within them is designed for the praise of Jesus Christ; and it is our privilege to lend our voices and our lives to this vast chorus of praise...."